Jumping Off Cliffs is a semi-regular blog about my writing life, personal muses, and occasional posts by guest bloggers. The title is derived from a quote by the great Ray Bradbury, who said about this writing life, "You've got to jump off cliffs everyday and build your wings on the way down." Hurricane Island has been on the market for about three months now, and it’s still drawing interest from reviewers and readers. The Florida Times Union is the latest newspaper to review my new thriller, and reviewer Tim O’Connell gave it a very good review indeed. Read the review here. 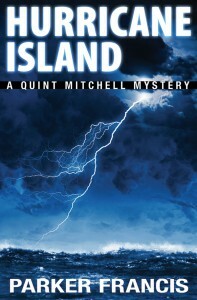 Hurricane Island is my most fast-paced story yet, with all of the major action taking place in 24 hours. 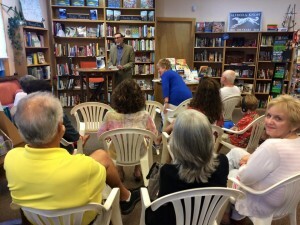 With interest growing, I’ve had several successful signings and talks, including at the Barnes & Noble at St. Johns Town Center in Jacksonville, and most recently at The BookMark in Neptune Beach where a nice crowd heard me talk about the book, my w riting process and answer questions. Here’s a photo from that talk. Check the Appearances page for my upcoming appearances. I am available to speak to book clubs, libraries or other organizations needing a speaker, so please feel free to contact me at authorparkerfrancis@gmail,com. « Seen any good books lately?